Could Microbes Be the Missing Link Between Diabetes and Gum Disease? Canada Pharmacy Online > Blog > Could Microbes Be the Missing Link Between Diabetes and Gum Disease? The past decade has seen explosive growth in the number of studies looking at how the microbes in your gut—collectively known as your gut microbiome—affect your overall health and well-being. But the gut isn’t the only body organ that we share with our microbial neighbours. The human mouth, for example, is home to over 700 species of bacteria. Like their gut-residing relatives, they play an important role in health. 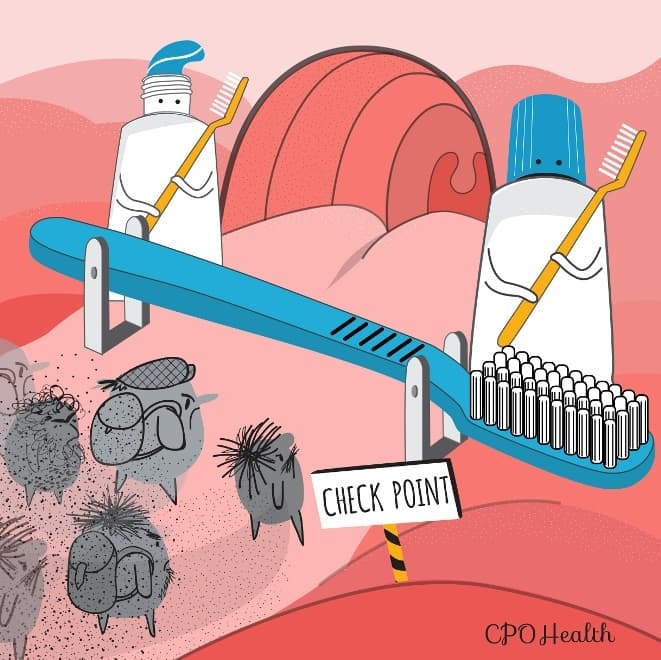 Changes in the oral microbiome have been linked to periodontal or gum disease, a common dental problem estimated to affect seven out of 10 Canadians at some point in their lifetime. The condition may be caused by bacteria in the mouth triggering inflammation that damages the soft tissue and bone supporting teeth. One of the biggest risk factors for periodontal disease (PD) is diabetes. Patients with diabetes are more likely to get PD and to develop more severe PD, especially if their blood sugar levels are not well managed. Now for the first time, researchers have shown that diabetes increases the likelihood and severity of PD by shifting the oral microbial community to a more disease-causing state. To study how diabetes affects the oral microbiome, researchers used mice carrying a genetic mutation that made them more prone to developing type 2 diabetes. The oral microbiomes of these mice and normal mice without the mutation were similar at the beginning of the study but started to diverge as blood sugar levels started to rise in the diabetic mice. The oral microbial community in the diabetic mice became less diverse and, they showed spikes in certain species of harmful bacteria. (These bacteria had been linked to PD in earlier studies.) At the same time, the diabetic mice also showed more severe oral inflammation and periodontal bone loss—they had less than half the amount of bone present in healthy animals. Next the researchers asked whether the oral microbiome of the diabetic mice was responsible for their PD symptoms. To answer this question, they transferred bacteria from the mouths of diabetic and healthy mice into the mouths of healthy mice that were missing their own microbiome. These so-called “germ-free” mice live in completely sterile environments devoid of any microorganisms and are often used to study how bacterial communities impact health. When the oral microbes of diabetic mice were transferred to germ-free mice, these mice had higher levels of inflammation and roughly 50% less bone than germ-free mice that received a bacterial transfer from healthy mice. Simply transferring the diabetes-associated mouth microbes alone—without changes in blood sugar level—were enough to cause the germ-free mice to develop symptoms of PD. Furthermore the researchers were able to partially counteract the harmful effects of the transfer by giving the mice an antibody to reduce oral inflammation. Germ-free mice that received the anti-inflammation medication before a bacterial transfer from diabetic mice had less oral inflammation and bone loss compared to the germ-free mice that received only the microbes. The antibody treatment also changed the microbial community to resemble more closely the oral microbiome of healthy mice. These results suggest that inflammation plays an important role in both the changes to the oral microbiome caused by diabetes as well as the ensuing soft tissue and bone damage seen in gum disease. Perhaps by targeting oral inflammation, we can reduce the risk of PD for people with diabetes and limit its severity in those already with the condition. Dr. Betty Zou is a science communicator and writer with a passion for all things microbial. She is based in Toronto, Canada.